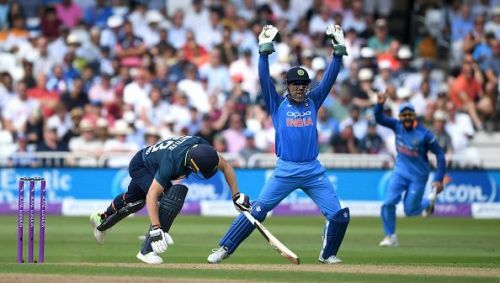 Can MS Dhoni cross 1000 dismissals as wicket-keeper? MS Dhoni is one of the most enigmatic cricketers to have ever taken the field. Few people have the cricketing acumen he possesses. Not to forget, he is the only captain to have won the 50 Over World Cup, T-20 World Cup and Champions Trophy. But can he break Mark Boucher's record of 998 dismissals and reach the golden figure of 1000 dismissals? Time will tell, but before that let me try to answer the same, mathematically. Brace yourselves. The below-mentioned figures will blow your mind. -- Tests - As we all know, MS Dhoni has retired from Test cricket. Can someone please bring him back? -- Fast forward to the 2019 Word Cup. As per the format, all 10 teams will play each other once. Each team gets to play 9 matches. The Top 4 will advance to the Semis and subsequently the top 2 to the Final. Let us assume that India reaches the final (This time for MS Dhoni). Therefore, 11 more games @ 1.27 - 14 dismissals. Total dismissals - 7 + 23 + 14 = 44. Considering the best case scenario, let us assume that the dismissal/match ratio will be 20% higher in the upcoming matches. Therefore, 44 * 1.2 = 53 dismissals. Another scintillating half-century by MS Dhoni. In my opinion, the total dismissals would be - 788 currently + 53 prospective = 841 dismissals! Obviously, if we add the IPL/CPL catches and stumpings, the figure would be considerably higher. So the likelihood of MS Dhoni breaking Boucher’s 998 record is bleak. Forget Boucher, the likelihood of Dhoni even breaking Gilchrist’s record of 905 dismissals seems far-fetched. But then knowing the self-less nature of Dhoni, this would be the last thing on his mind! Side Note - MS Dhoni will end up with the highest number of stumpings ever. And that makes sense, because Dhoni stumps not only the batsmen but also every viewer!